When I talk about email marketing with clients, I often use the analogy of a war. There are many battles that you have to win if you want to ultimately win the war. 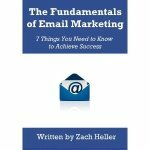 In email marketing, there are hundreds of little components you can tweak and adjust, and when they all come together just so, you will find success. Some of those components include the time of day or day or week you send your emails, the subject line, the signoff, the images you use, and the number of links you include. Some marketers would have you think that it’s all relative, and that what works for one company won’t necessarily work for others. And while that’s true, it’s also an easy cop out for those that don’t know the tried and true strategies that give you the best chance to succeed. So I invite you to download my 50 Golden Rules of Email Marketing for free, and get started on your way to better email marketing campaigns for years to come! The first person to leave a comment on this post will win a signed copy of my latest book, Branding for Bloggers: Tips to Grow Your Online Audience and Maximize Your Income. Leave a comment here and we’ll connect so that I can get your shipping address!